Rest is okay, but there’s something about too much rest that makes me sick. Even Tom can’t put up with me being confined to boat-arrests any longer! At this point he’s worn out by my tantrums so much that he agrees to take me for a stroll in the village. 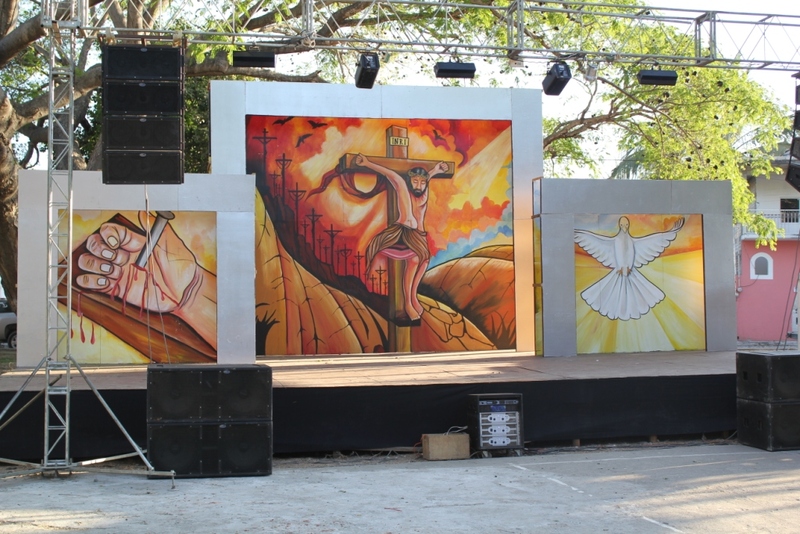 The Semana Santa (Holy Week) is on its tail-end, the weeklong Easter festivities almost over. It is, however, the beginning of the weeklong celebration of Santa Cruz, the Patron Saint of this wonderful town. Yes, two back-to-back weeks of crazy, noisy, colorful celebrations! The carnival arrives in town; all the rides spread out and find a spot in the village, clogging the small streets and blocking most accesses and exits. We’re under siege! The strangest part of these two overlapping weeks is the sequence and intermingling of celebrations. 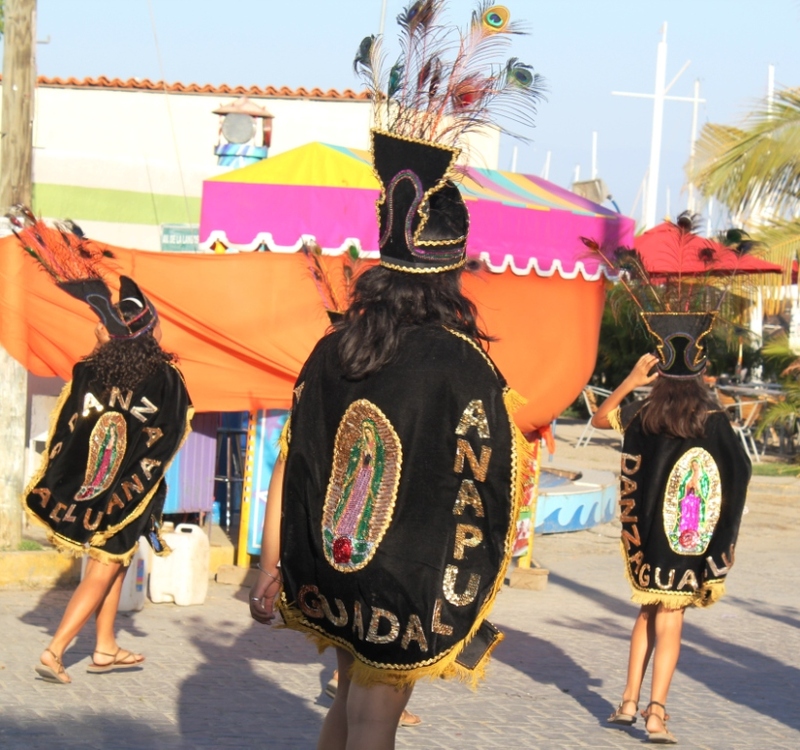 For the Semana Santa, religious traditions and celebrations are the main attraction. It starts every day at 6 in the morning with twenty very loud petards fired up in the air to alert the villagers that Holy Mass will start in about an hour. At 7 am, another loud bang to signal Mass has started. Between 7 and 8, the sound of religious hymns and melodious chanting reaches the Marina. I’m surprised I even hear them, what with my ears ringing and all… At 8 am, a final explosion to signal that Mass is over. Then it remains quiet for the rest of the day. At 6 pm, 10 loud bangs signal that in half an hour the Holy Procession will leave a small church on the opposite end of the village. The noise is earsplitting and terrifying. The village dogs go crazy, the unsuspecting tourists run for cover, we plug our ears. The locals just smile smugly. Half an hour later, another loud bang announces the start of the Procession. It will sneak its way thru the village, pass the Plaza and reach the church at the other end of the village. Tom and I sit on the low wall that borders the Plaza, surrounded mostly by local families and wide-eyed kids gathered to see the Procession. Leading the Holy Procession - Bring some "zing" to devotion! At first we hear sirens: of course there’s a Police car leading the way, clearing the non-existent traffic. Behind the Police car follows a dozen or so young ladies in Aztec costumes with majestic headdresses made of peacock feathers dancing to the hypnotic rhythm of just one drum. They all have many tiny wooden bells attached to their ankles producing a surprisingly harmonious melody with every movement. After this group comes a pick-up truck, dressed up as a shrine with a priest in full regalia and two children all bandaged up -all of this in the pick-up bed-, to depict a scene of healing though prayer. A small mob of parishioners follows the shrine-on-wheels, chanting and praying. 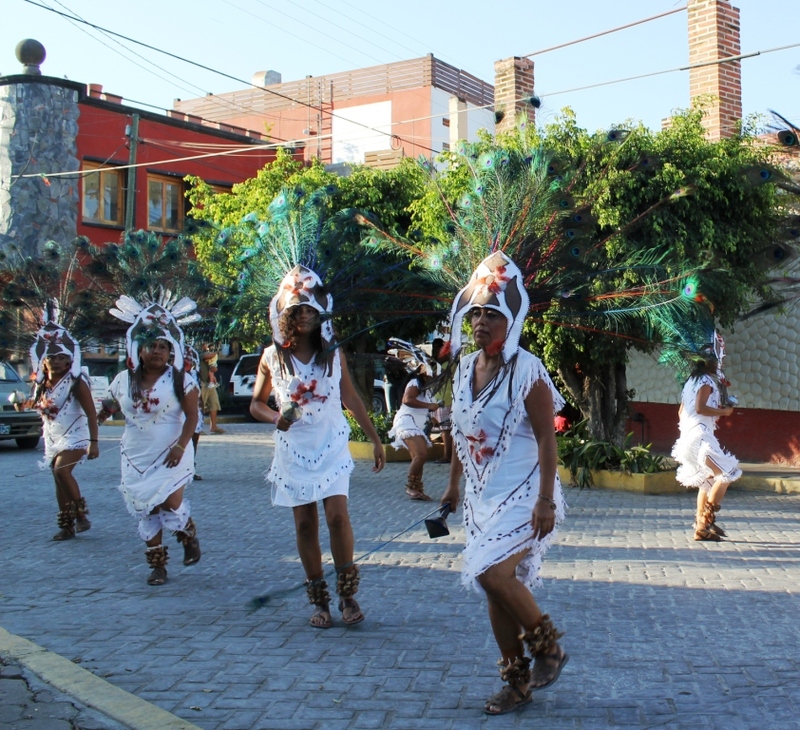 Closing the procession is a group of religious cheerleaders in a different costume, the team “Danza Guadalupana”, sporting the Virgin of Guadalupe embroidered on their black velvet cape. Great Cape! I wonder, does it have Magic Powers? We follow the procession to the church’s gates. At the church entrance the parade splits in a very orderly fashion. 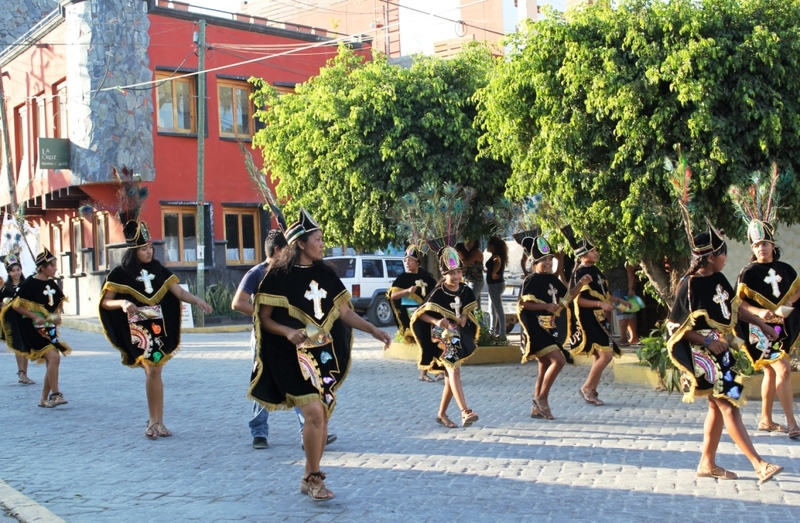 The dancers enter the church, the truck-shrine parks on the side, the parishioners take their seats and the last group of dancers enters. The traditional Catholic chants start, merging with the sound of the drum that is still leading the girls’ dance. 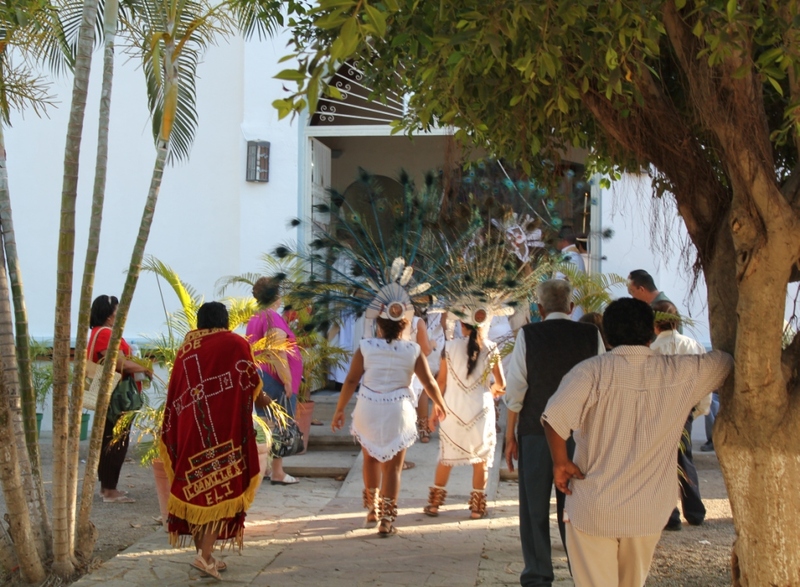 Slowly and backwards, the dancers exit the Church, bowing to the altar; their movement subdued, their footsteps softer, until they’re all out in the church’s front yard. Mass starts. This last part was the most surprising mingling of sacred and pagan rituals I have ever witnessed! The Procession is repeated every night, each time with some small variation. Last night, for instance, a marching band in full white and gold uniform followed the dancers, trumpets lending a much more festive note to the leading drum. I just wish I knew more about the meaning and tradition of it all, as it sure is very picturesque and deeply touching to watch. Unfailingly, at 8pm another long series of loud explosions signals the end of Mass and the beginning of debauchery. The last petard is still up in the air as the carnival rides open, turning on bright lights and loud music to attract the eager public. This cheerful chaos will go on in various degrees of noisiness until about 4 am. Two hours after this, the whole circle starts again. Santa Cruz, protect our ears!